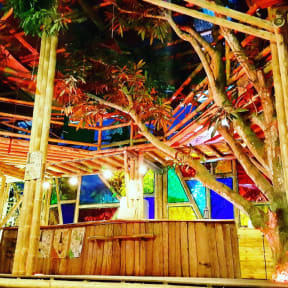 Kanta Sana is a concept built to offer the guest a mix of nature and architecture. Our hostel is built across a sandy garden where you can find mango tree, coconut and other kind of fruits. Kanta Sana offer a great camp fire where you can relax, party and enjoy a grill, close to an amazing garden where will you find different flowers, birds and nice harvest. Our restaurant/lounge offers the best fusion of seafood and vegetarian dishes and typical Caribbean cocktail. You won’t want to leave this place! Kanta Sana is located in the heart of Palomino, a small nature paradise on the sea, near the jungle. The hostel is located in one of the two roads leading to the beach that can be reached in 7 minutes. Our hostel is only 5 minutes walking to the main street. 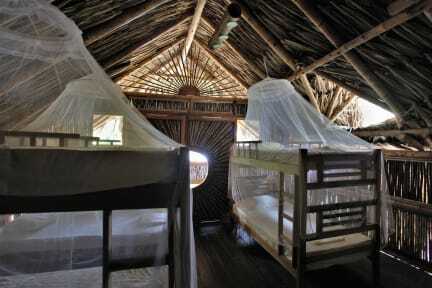 Our rooms are on a covered bamboo platform built around two mango trees, shared in two sides 4 beds each one mats placed on the floor with mosquito’s nets. One of two rooms situated at the first floor of the bamboo house, endowed of three bunk beds, mosquito nets, fan, light for the night time, electrical outlets for charge devices and big shady terrace for chill, drink something or read. Reception Time 07:00 to 22:00. (In case of late arrival please make sure to inform us via email or phone call).